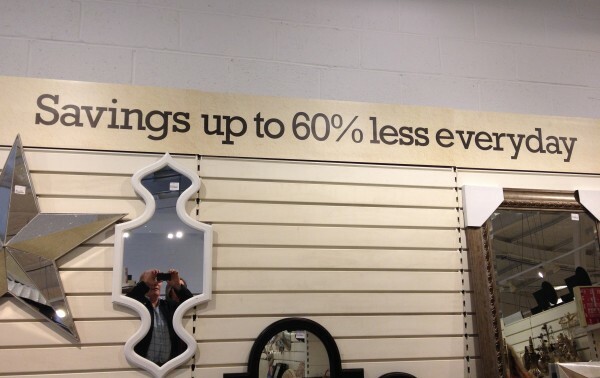 In-store signage is often not very well thought out. Long-time readers may remember the seasonal toilet rolls at one of my local stores, and an aisle entirely free of long-life milk at another. The bizarre messages continue elsewhere in the store. Above one checkout was a sign with an arrow saying “Pay up to 60% less here.” Less than what? Less than the ticketed price? Less than at any other checkout in the store? Do these people have any grasp of how meaningless these signs are? Or — more worryingly — do signs as meaningless as this actually work on the general populace? Now, they may be cleverer than they look. My nephew Matt points out that they might be trying to encourage people to buy today because the savings will be lower tomorrow. This does make some sense, because it’s the kind of store that, though it looks mildly interesting from the outside, I think few people would voluntarily enter twice. 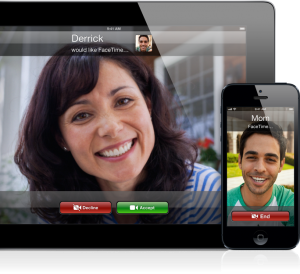 It’s three years since Steve Jobs announced FaceTime, Apple’s video chat technology. It’s a fine system, and yet I realise that I can count the number of times I’ve used it on the fingers of one hand. This is chiefly because Skype does rather more, and does it on non-Apple devices. I have dozens of Skype contacts, and can easily see which of them are online and likely to be disturbable at any time. With FaceTime, I haven’t yet even found a list showing which of my friends have it. However, the thing Skype doesn’t particularly give you is a good mobile experience. I’ve used it on my phone a great deal when abroad; with hotel wifi it can save a fortune in roaming charges. But, on iOS at least, you want to turn it off as soon as you’re done with it and not leave it running in the background, or your battery won’t last beyond your siesta. So it’s a way for you to contact other people, but not for them to contact you. FaceTime should handle this much better. With the release of IOS 7, too, FaceTime gains an audio-only option, making it more of a direct Skype competitor (something Google Hangouts also need to offer, by the way). And as Skype’s user interface gets progressively worse with each release (something that can’t be blamed solely on their new owners, Microsoft) and since it’s no longer the secure service it once was (something which can), I think I may be giving FaceTime more of a trial in the future. I’ve just noticed that Twitter allows you to export your tweets, under your account settings. They come in both human and machine-readable form. Not sure how long ago they added this, but it partially addresses one of my chief concerns about the service: that users stick many years of their lives into it without necessarily knowing that they’ll ever be able to extract the information in future. This is not easy to automate, though, so I’m still going to keep using Archive My Tweets for my own archive.